Q: I work for a pharmaceutical company that manufactures soft gel capsules. What is the proper way to select a sample size when using ANSI/ASQ Z1.4-2008: Sampling Procedures and Tables for Inspection by Attributes? I’ll further illustrate my question with an example. If one were to have a batch size of 20,000 units, according to General Inspection Level II, Normal, the corresponding letter code is “M.” In the master table for Acceptable Quality Levels (AQLs), the sample size would be 315 units. If my AQL is 0.010 (with an acceptance/rejection number of 0/1 based on the table), does my sample size change to 1250 units? Or does it remain at 315 units? A: The simple answer is 1250, not 315 suggested for sample size letter M. General Inspection Level II, Normal, shows that for a lot size of 20,000, a sample size code level of M corresponds to a sample size of 315. 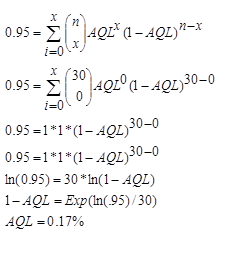 For an AQL of 0.01, the arrow points to a sample size of 1250 (sample size letter code Q) to have the required AQL of 0.01. The calculation of AQL is not dependent on lot size. 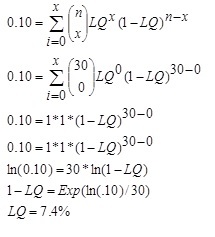 In other words, a sample size of 315 gives a minimum AQL of 0.04, so a larger sample is required to estimate an AQL of 0.01. Q2: Could you please add another layer to your response? The reason I’m seeking additional clarification is that the first step in determining the sample size is to find the letter code and the corresponding sample size. To me, it feels like the first step should be to determine the AQL. A2: Let me expand with a more technical explanation. Attribute sampling is based on the hypergeometric distribution and is estimated using the binomial distribution (which assumes an infinite population size). If you are using Z1.4, your sample size is selected based on your lot size. Then, you would pick the AQL you need based on the risk you are willing to take for the process average of percent defective. If you decide to not use Z1.4, but instead use the binomial directly, then you are correct that you would decide on the AQL and lot tolerance proportion defective (LTPD) first, then calculate a sample size for c=0, c=1, c=2, and etc.